The whole point of cloud computing and Google Docs is to make your life easier. 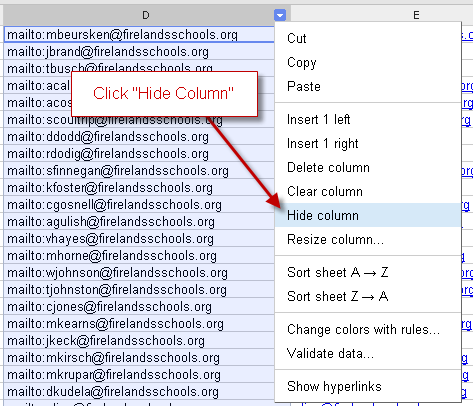 Recently I moved our teacher email list that was on our website to a Google Spreadsheet and used the Publish feature to make it available on our website. The issue with the spreadsheet was you were unable to click on the email address to automatically open your email program and set the To: portion in your program. Until now. By utilizing 2 formula’s in Google Docs you can take your list of addresses and make them clickable. Now we are going to get into our first formula, the Concatenate function. This function allows you to tie 2 cells together and merge them together. You can do this by typing in “=CONCATENATE” we now have to add “mailto:” to the users email address. Highlight the cell and drag it to then bottom of your list. If you have any questions feel free to let me know! The features you love now synched to the cloud!